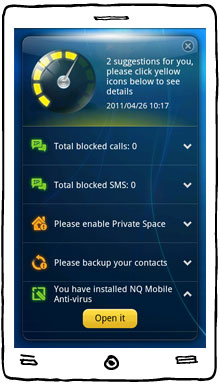 NetQin Mobile Manager for Android is designed to keep users in control of their phone, with a private space within the phone. It features a call manager including a black list, a cross-platform backup plan for contacts in case they are lost or need to be transferred to a new device, a hidden area in the phone for privacy. This feature also to eases the process of upgrading to a new phone, as it is available cross-platform to Android and Symbian. ...... Quickly and easily delete the call history and SMS messages between your phone and individual contacts permanently to protect private data. All with the ease of one touch of a button, erase all call and text records between your device and another one's, leaving no trace that it ever existed. Tired of pesky sales calls or ex's calling all the time? Put them in your blacklist to keep them away! By adding unwanted callers into the black list, unwanted harassing calls and texts will be automatically rejected by the system, allowing you go on without the distraction from unwanted calls. Backup and restore contacts to our server. This allows users to retrieve their complete contact list to the same or a different device, making sure the loss of a device does not equate to the lost of precious contacts. Android is an out-of-this-world kind of loderunner game. MSDE Manager allows you to do all of the common operations of MSDE admin. SMS Manager is a utility which gives you a cool interface to send SMS. DTaskManager is a stand-alone fully featured Task-Manager. Mail Manager 1.0 effectively controls all steps in email delivery. Create your own ringtones & logos for mobile phones! Qweas is providing links to NetQin Mobile Manager for Android 4.2 as a courtesy, and makes no representations regarding NetQin Mobile Manager for Android or any other applications or any information related thereto. Any questions, complaints or claims regarding this application NetQin Mobile Manager for Android 4.2 must be directed to the appropriate software vendor. You may click the publisher link of NetQin Mobile Manager for Android on the top of this page to get more details about the vendor.